So it is really important for employers to create a positive, healthy workplace, where employees have mutual respect, feel valued and appreciated as these things all strongly contribute to creating happy employees. It is a proven fact that employees respond to praise and appreciation expressed through recognition of their good work, because it reinforces their work is valued. When employees feel like this, their satisfaction and productivity rises and they are motivated to keep up or improve their good work. Doesn’t everyone appreciate a ‘pat on the back’ to make them feel good, I know I definitely do! Make sure you communicate, as we know feedback whether good or bad is fundamental in the workplace. You need to discuss regularly with employees what they have accomplished and what is going well in their job, helping them to feel connected and part of a team. Delivering feedback ensures your team strengths are being highlighted and made good use of, and of course gives employees direction on what they can improve on. Look for ways to celebrate with your team whether it’s an employee birthday or recognising a milestone or achieving a goal. 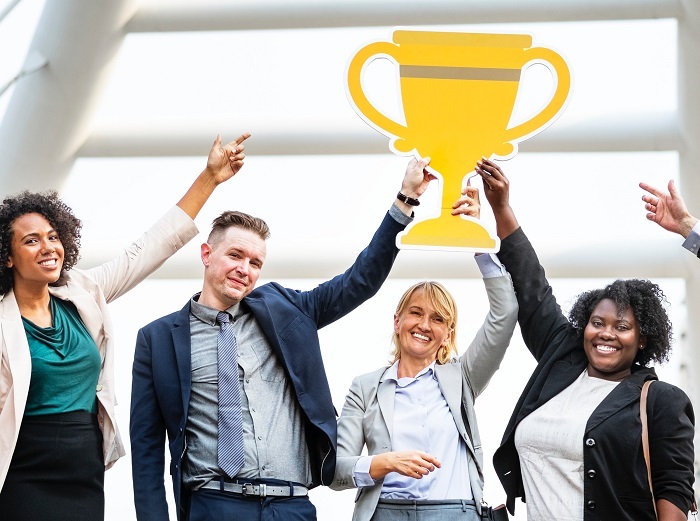 Honoring wins and milestones improves morale by encouraging the person recognised and showing team members that important events are noticed and praised. As an employer you may not always be able to reward by means of a pay-rise, but there are alternative ways to reward your employees, implementing exciting incentives that give the employee something tangible to work towards, such as a competition to win a gift card – which are low cost and give the employee the choice of what they want. If you need any help or guidance about creating a positive workplace, give us a call.